The first week of art classes at Manchester Elementary brings a flurry of questions. 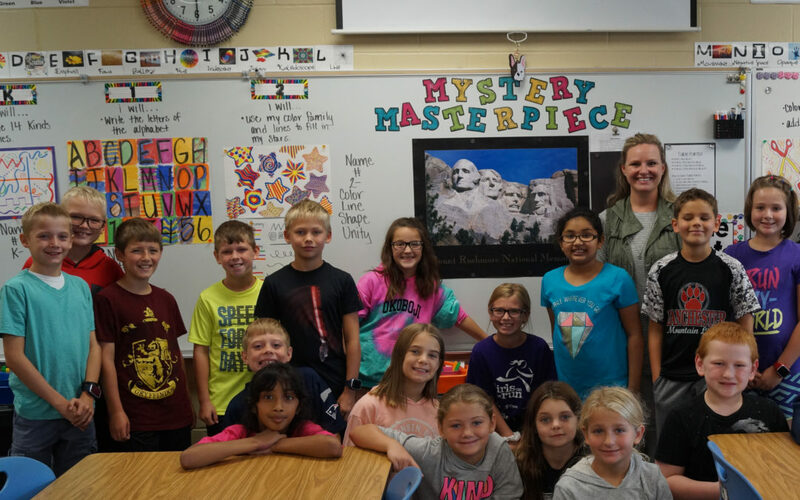 “Can’t we just take a quick peek?” “Are you sure we have to wait?” “Is it time to see it yet?” The excitement surrounds one of art teacher Chelsea Bang’s most favorite aspects of elementary art – The Mystery Masterpiece. Annually, Mrs. Bang chooses a famous work of art and then researches little-known facts about it to share with every art class on a weekly basis. Some pieces are easy to research; after all, she found nearly 70 little-known facts about the Mona Lisa. For others, she has to dig a little to find tidbits that will keep students excited about coming back to learn more every week. The goal is to introduce students to a piece of art that they don’t study in depth for any other reason throughout the year while adding a little bit of Art History into students’ worlds. This is the 4th year Mrs. Bang has done “Mystery Masterpiece” and word is spreading. Students are getting on board, even going so far as to check out library books about the year’s masterpiece to try to beat Mrs. Bang in sharing the facts. The fun comes as students get excited about something new and their ability to have entire family conversations about the piece. Every grade level learns about the same piece, so “Siblings take the new fact of the week home and share it with their parents, who can use it as a platform for common conversation topics”, Mrs. Bang says. This year, Mt. Rushmore is the face of the Mystery Masterpiece, which most students didn’t even realize qualified as a “work of art”. The logic for choosing this piece was easy for Mrs. Bang – so many families travel to see Mt. Rushmore that the students can really relate. In fact, several learned that they’re among the 3 million visitors to the monument annually, which was pretty cool! At the end of the year, every kindergarten through fifth-grade student will know over 35 facts about Mt. Rushmore and they’ll leave in May already looking forward to finding out what masterpiece they’ll gain new knowledge on next year!